Office parties, pot luck dinners, relatives that need a gift but are hard to shop for? Sometimes a little humor will save the day. 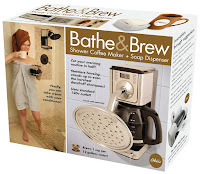 Considering the kinds of crazy tech items that really are available out there, the "Bathe and Brew" almost seems believable. The drawback is that you still have to come up with a real gift to pack inside the joke box. I have never had a cat who would tolerate wearing a hat. Some people have more patient pets, or maybe they're just more persistent than I am. Although the "cats love it" slogan seems overly optimistic, if you have a fan of animal cosplay on your list, this unicorn horn might be just the thing. Adult coloring books - which have become extremely popular of late - usually have complex designs. 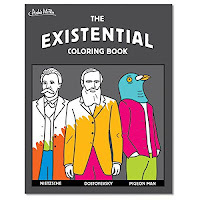 The Existential Coloring Book keeps the artwork simple, aiming at complex thoughts instead. For the busy cook on your list, this banana slicer has the advantage of being both cheap and functional. However, I have the feeling that cleaning it afterwards would be more work than slicing a banana the old-fashioned way. Please, don't disappoint and hurt a spouse, friend, or family member who has higher expectations and is likely to give you something really nice. It's best to reserve joke gifts for situations when you know they will be appreciated. They work well among friends who have a tradition of giving silly gifts, at parties where they have been specifically requested, or for someone (with a good sense of humor) who wasn't expecting to exchange gifts with you.